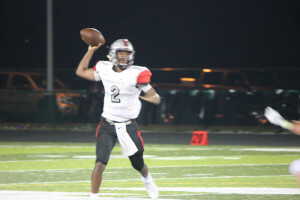 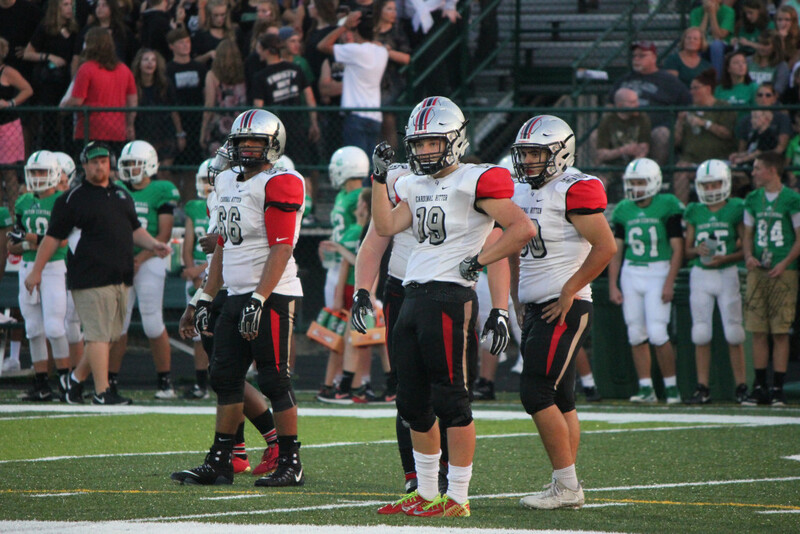 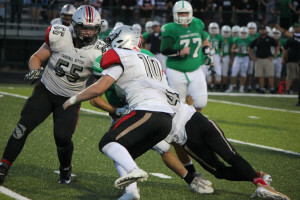 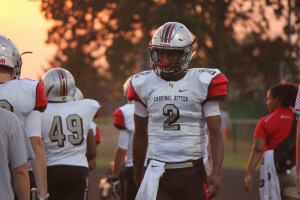 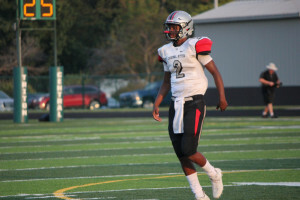 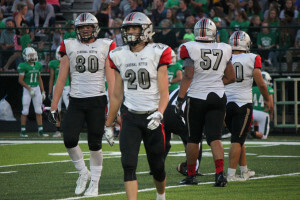 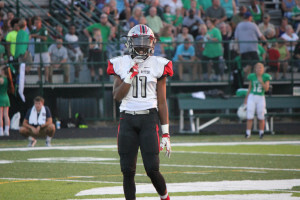 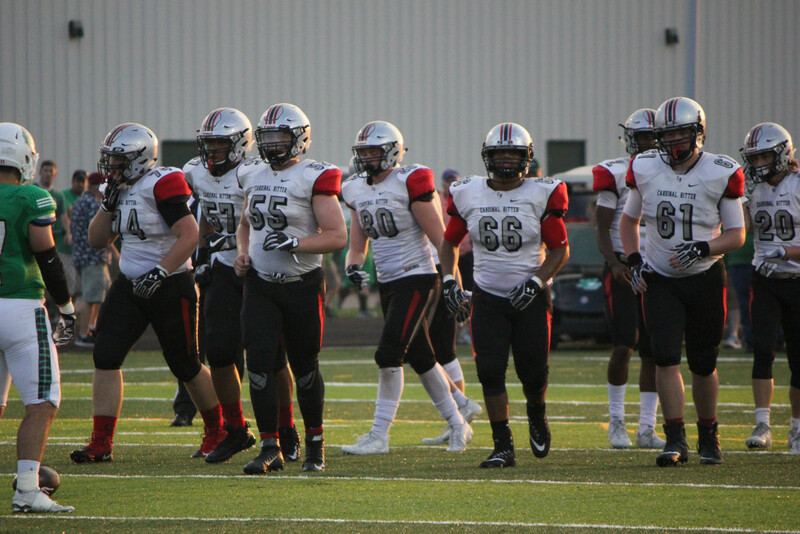 The Cardinal Ritter Football Team traveled to Triton Central to play the Tigers, who were celebrating their homecoming on Friday night. Throughout the majority of the game, the Raiders and the Tigers were deadlocked. However, in the final minutes of the game, Triton Central pulled ahead and emerged victorious. 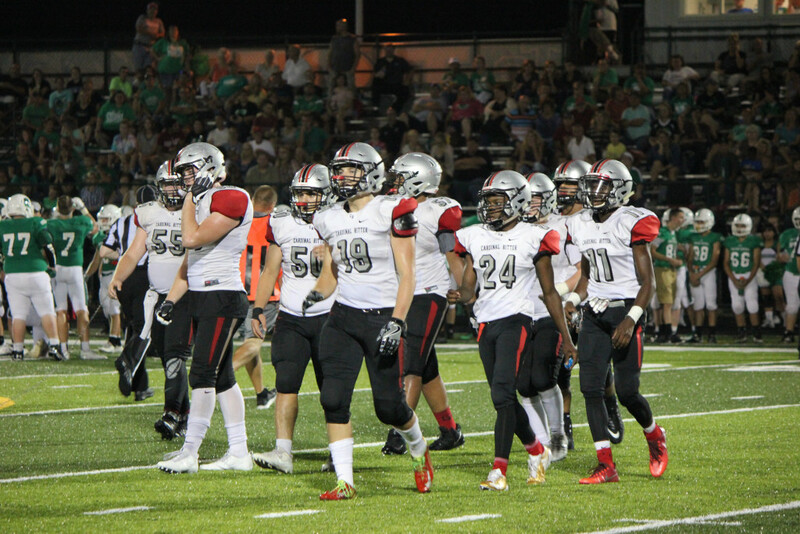 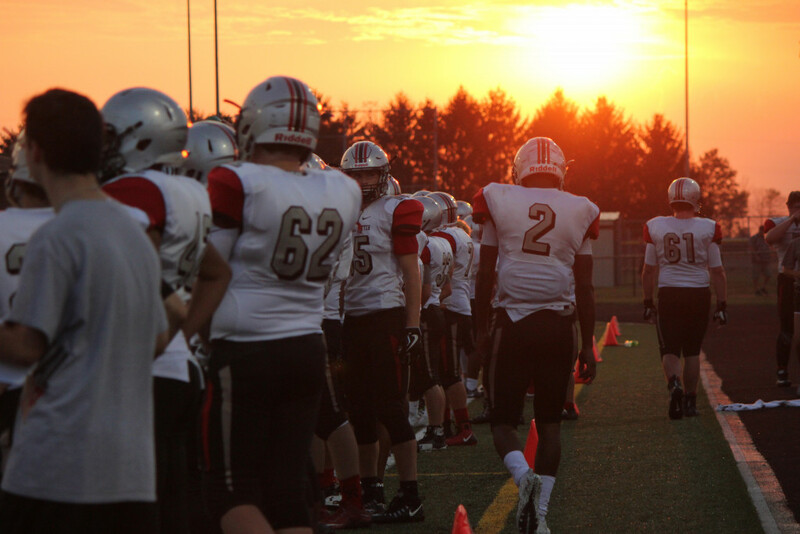 After a long battle, the final score was 28-21, ending Cardinal Ritter’s undefeated streak. 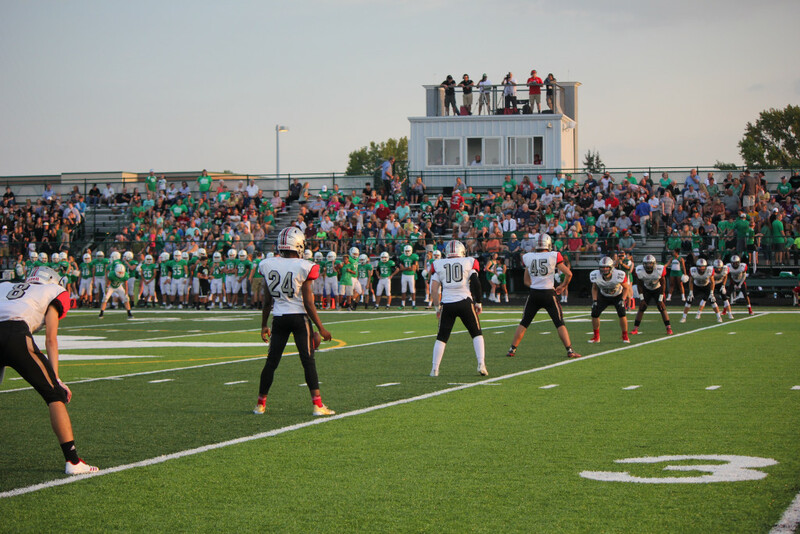 As the game opened up, the ball changed hands back and forth between the two teams. 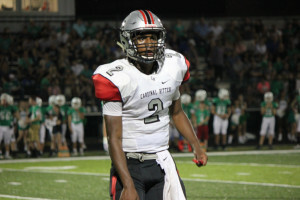 Cardinal Ritter threw an interception, turning over the ball at their own 41 yard line. 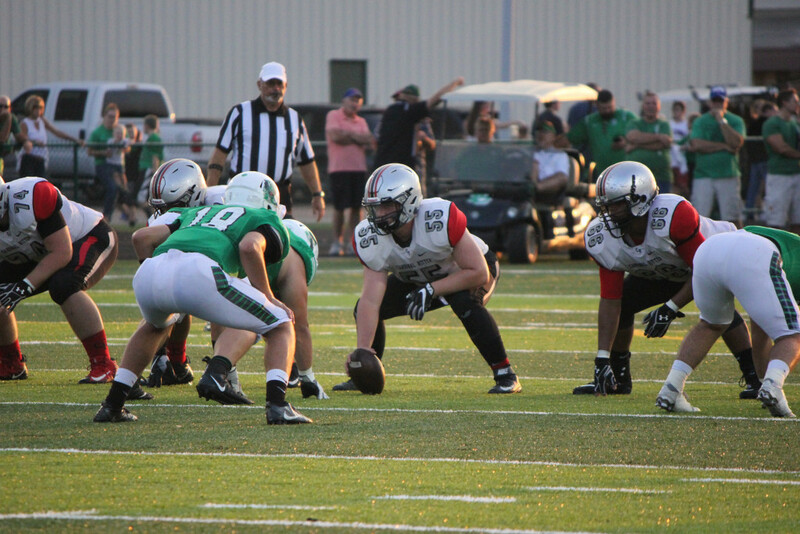 The Tigers ran the ball and gained 13 yards from a personal foul against the Raiders. 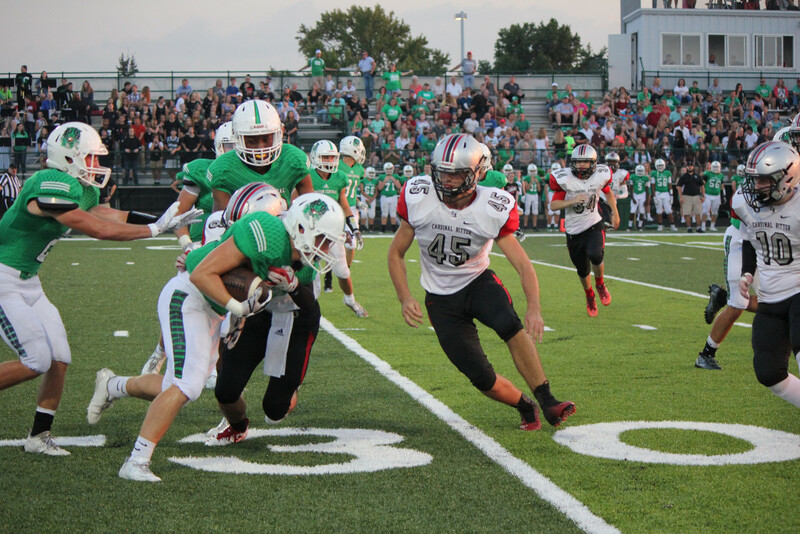 Triton Central attempted a pass, but Jake “the Snake” Kluemper was there to break it up, rendering it incomplete. The Tigers picked up a gain of five and were tackled by Donovan Morris. 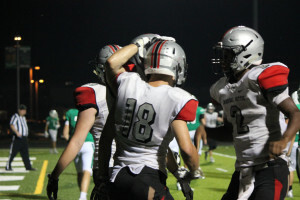 Three plays later, the Tigers, sticking with their running game, scored a touchdown with 4:44 left in the first quarter. The PAT was good and Cardinal Ritter got set to receive the ball. 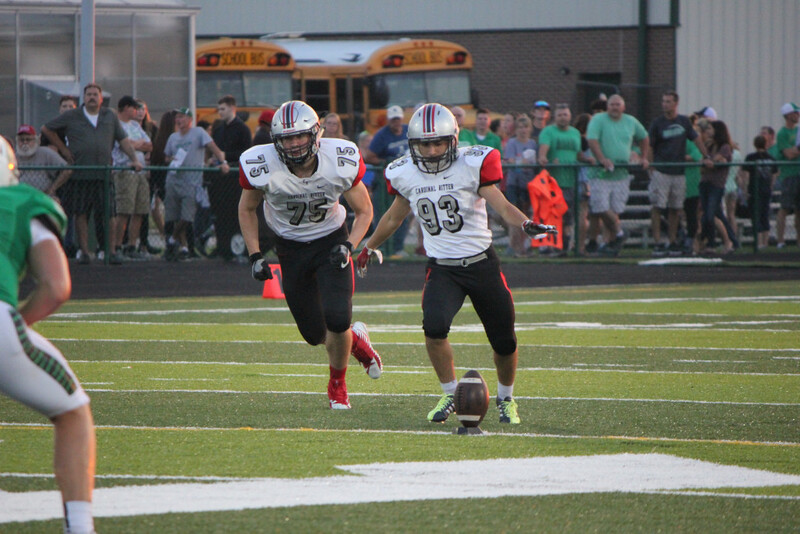 Brad “Big Play” Bacon returned the kick to the Raider 39. Diomoni “Supreme” Small picked up a yard on first down and Henry “A-Bomb” Woodcock caught a massive 55-yard pass from Small for a first down. 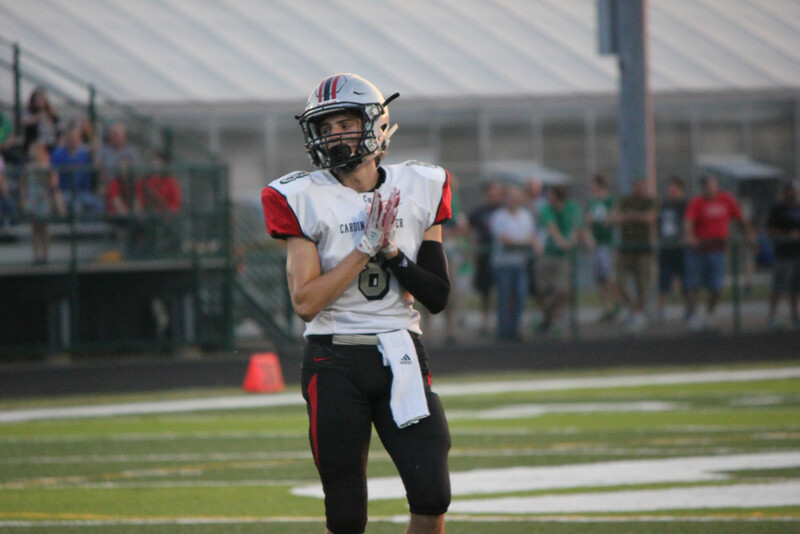 From the Tiger 25 yard line, Kluemper caught a short pass from Small and carried it into the endzone, scoring for Cardinal Ritter just over one minute after the Tigers. Triton Central was charged with encroachment during the point after, which was good, thanks to Matthew “Ironfoot” Boberg. Boberg kicked the ball back to the Tigers, who started their next drive from their own 30 yard line. 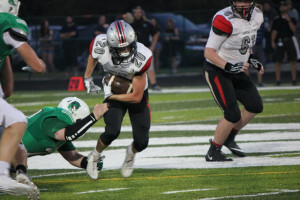 The Tigers picked up right where they left off with their running strategy, driving the ball down the field play after play. Marlon Anderson, Javon Rodgers, Daniel “the Slammer” Ayala, and Donovan Morris all fought on defense to slow down Triton Central. 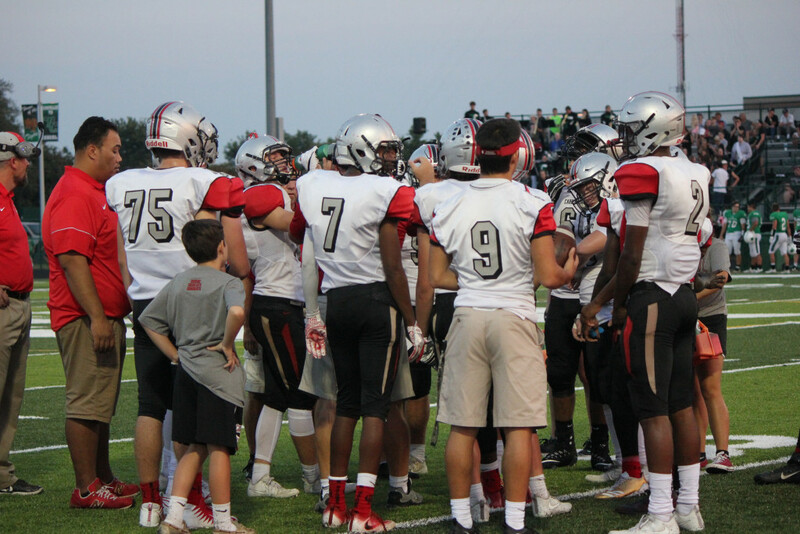 At the end of the first quarter, the score was tied 7-7. The Tigers started the second quarter on 2nd and 6 from the Raider 26. 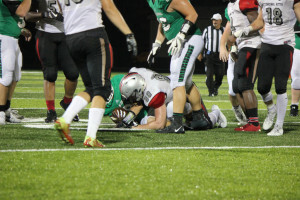 They were flagged for offsides, costing them 5 yards. 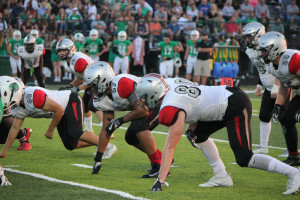 Ayala, Kluemper, and Bryce “Black and Blue” Giebel each pushed against the O-line, but the Tigers pushed back, moving up to the Raider 18 yard line before being penalized for illegal motion, taking them back another five yards. 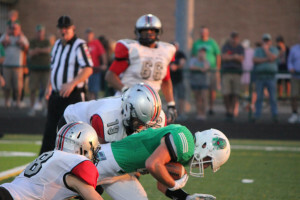 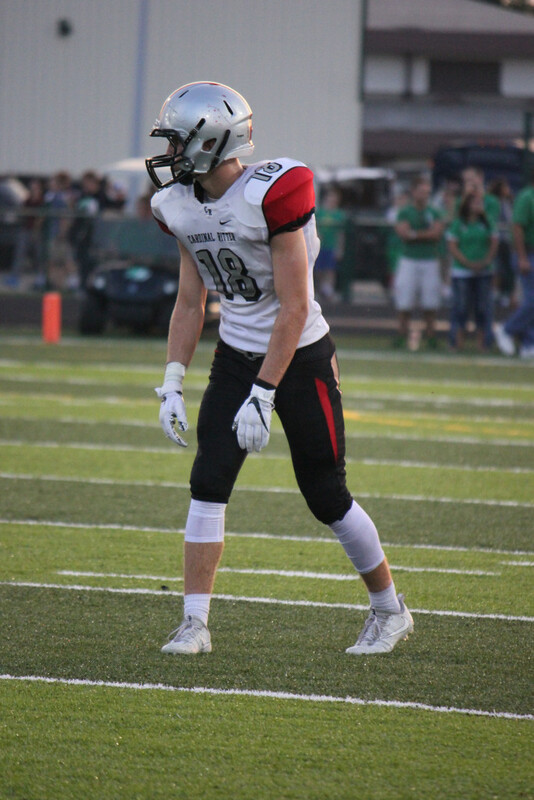 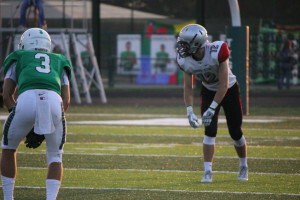 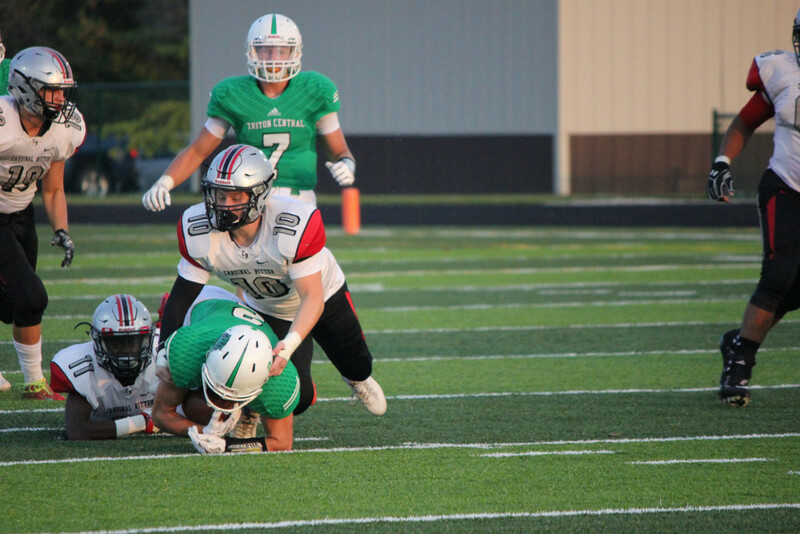 Triton Central continued running and passing the ball, fighting against the forces of Kluemper, Seth “the Kraken” Knutson, and Darrell “Quicksilver” Roberson. With 6:40 remaining before halftime, the Tigers scored another touchdown. 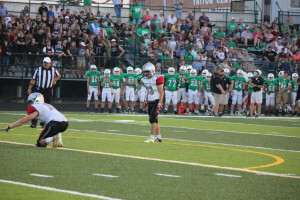 The point after was good and Bacon carried the return kick to the Raider 46 yard line. 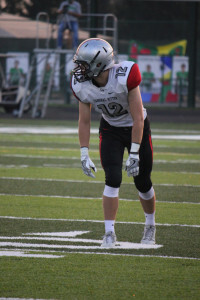 The Raiders suffered a loss of 2 on first down, but Knutson had a gain of 4 on second. 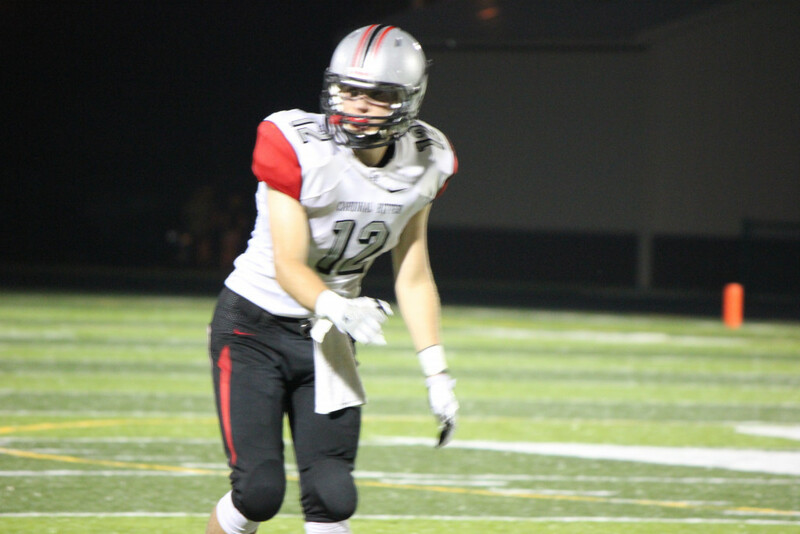 Kluemper caught a pass from Small for 7 yards and Knutson made the 4th down conversion by picking up another 3 yards. 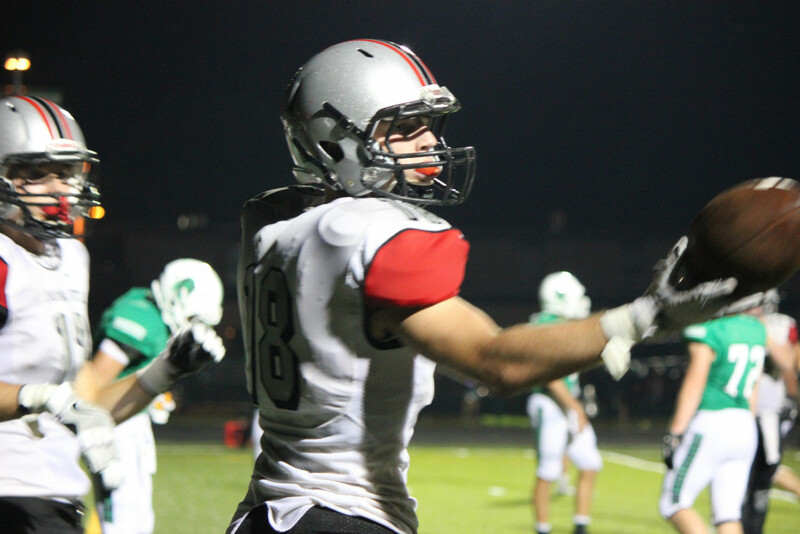 Kluemper caught two more balls from Small for 23 yards collectively, taking the Raiders to the Tiger 19. Knutson picked up 2 yards on first down, complemented by another 6 from Small on second down. 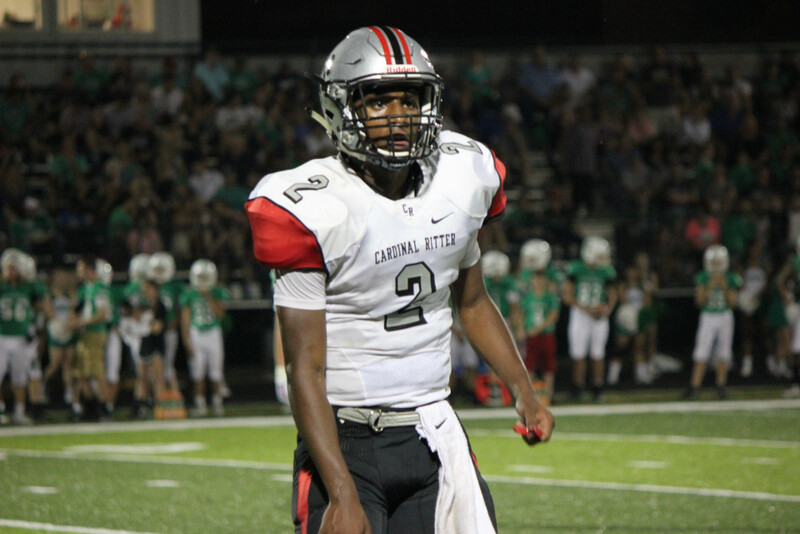 With time running down, Cardinal Ritter called a timeout with 1:39 left in the first half. 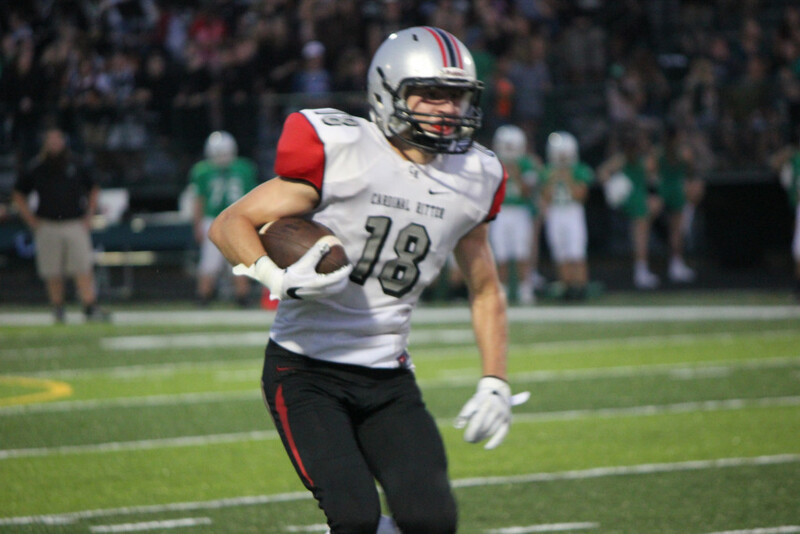 After a brief conference, Knutson ran the last 11 yards to the endzone for a Raider touchdown. 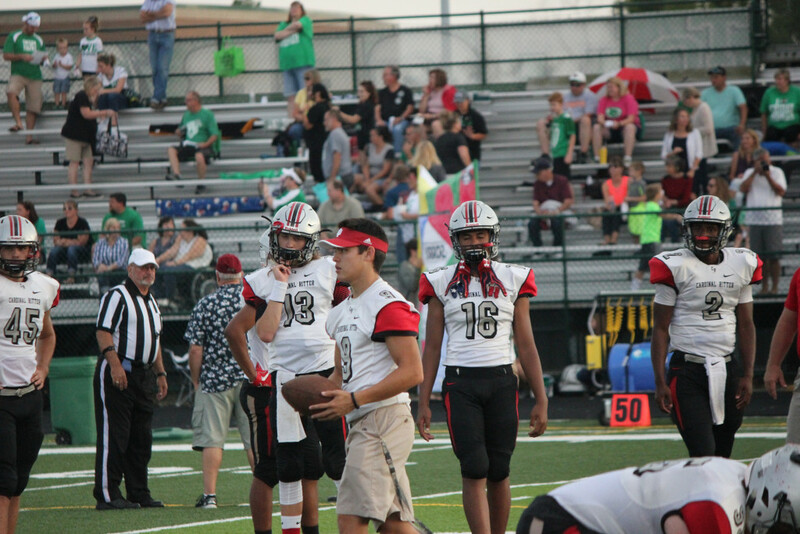 The point after was good and Boberg kicked a touchback on the return. 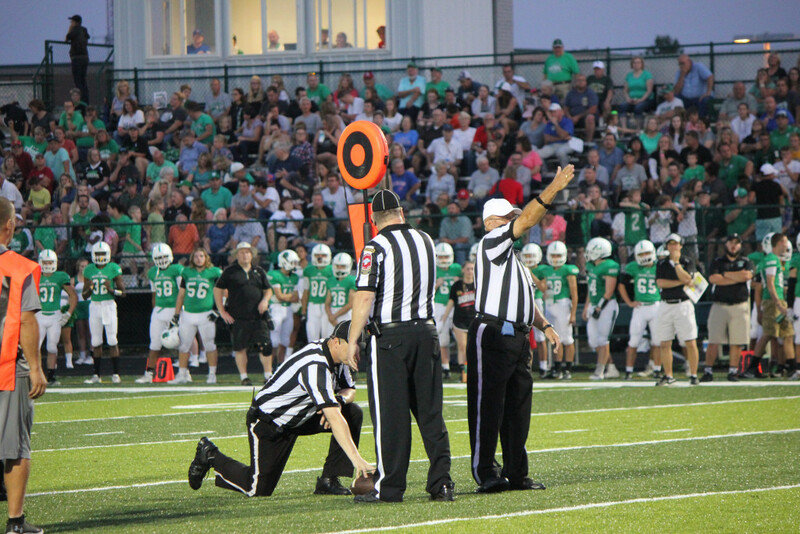 On first down from their own 20, the Tigers ran the ball, but Dillon “Rube” Olejnik forced a fumble, which Triton Central recovered. 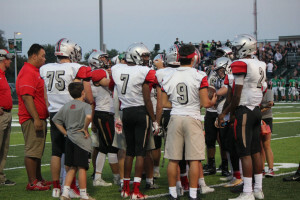 The Tigers ran for 17 yards on first down, threw an incomplete pass, and suffered a loss of 2 on second before halftime rolled around. 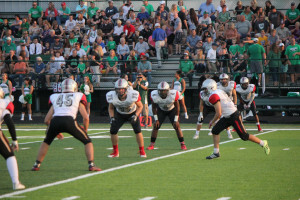 The score remained deadlocked at 14-14. The third quarter was certainly not the game of champions, or even point scorers. 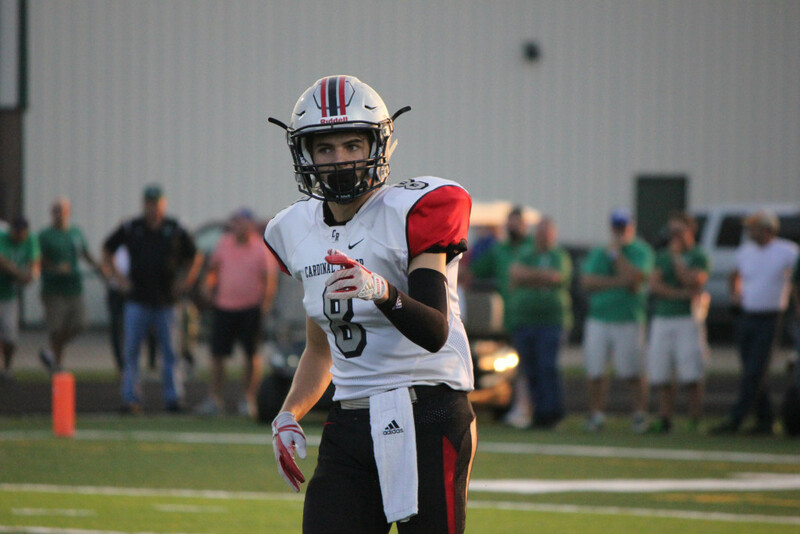 The Tigers kicked the ball to Bacon, who returned it to the Raider 41 yard line. 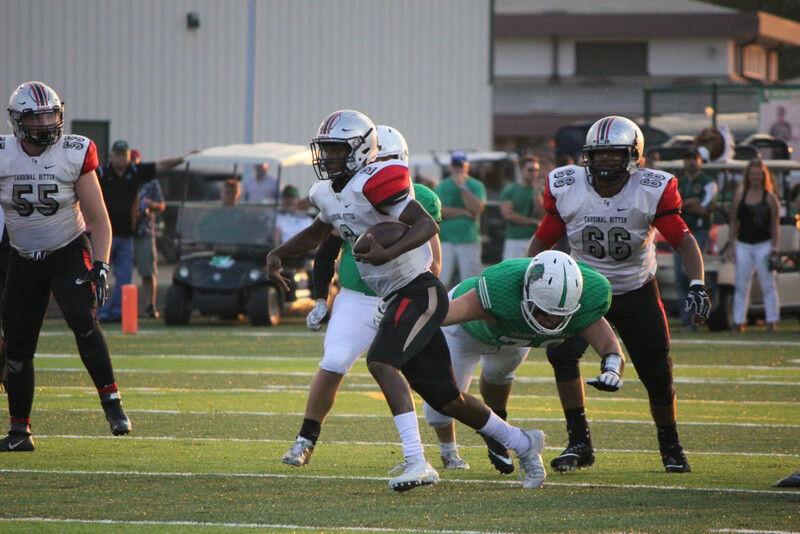 Small ran the ball on first down and the Raiders gained 5 yards from a face mask penalty against the Tigers. 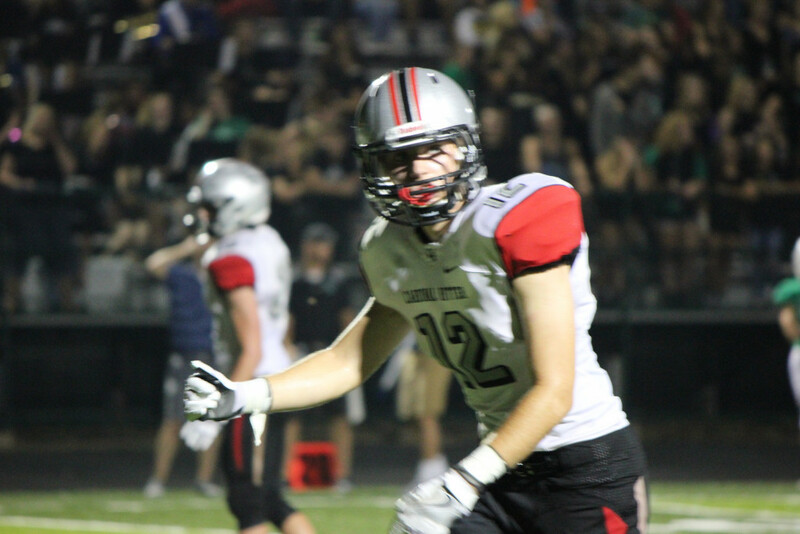 After an incomplete pass on 2nd and 4, Knutson drove the ball forward for another 3 yards. 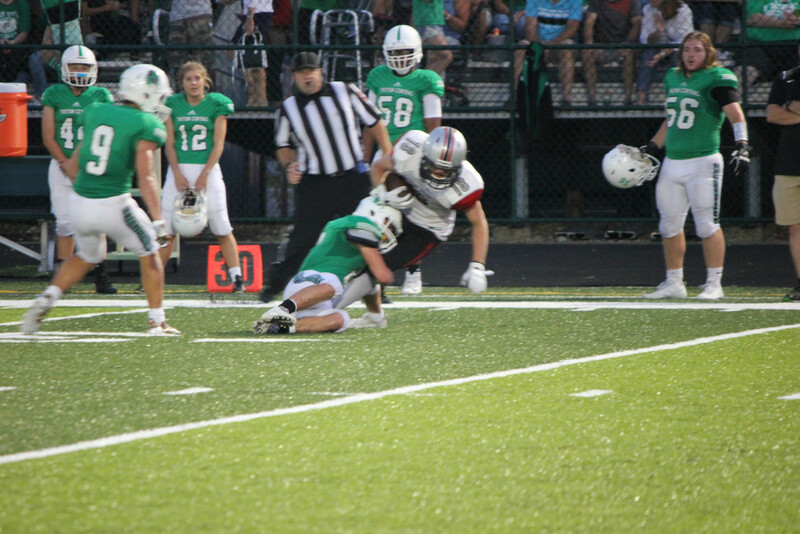 Small caught a high snap and managed to charge forward for a gain of 2, securing another first down. 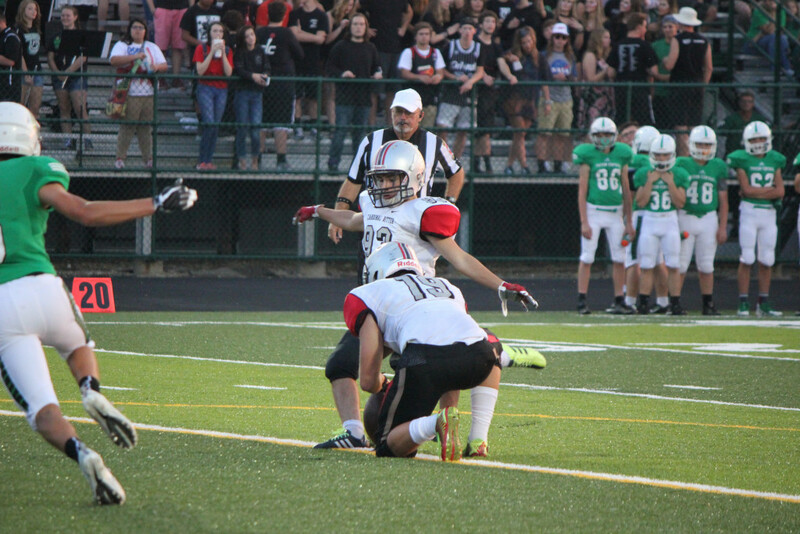 However, the Raiders threw an interception on the following play at the 50 yard line. 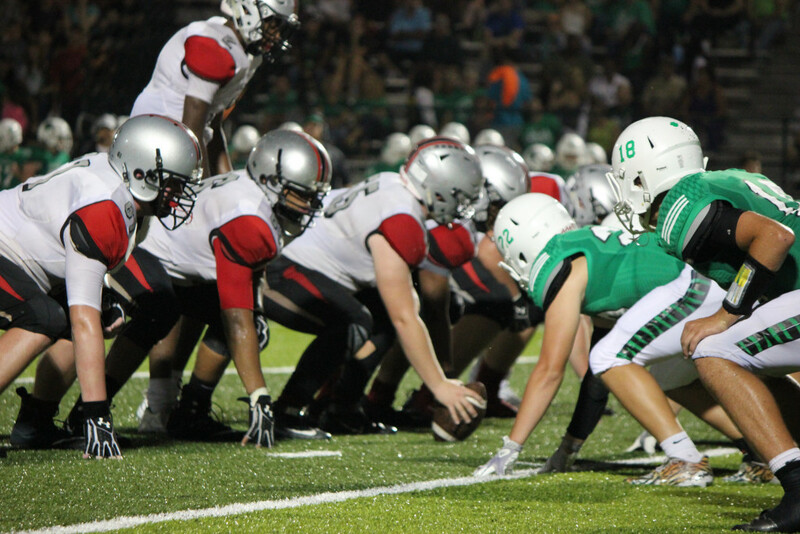 Between first and second down, the Tigers only gained 5 yards, stopped by the tackles of Anderson and Olejnik. 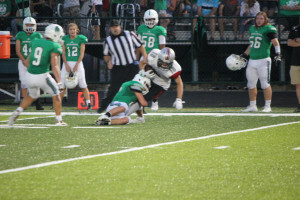 Woodcock sacked the quarterback on 3rd and 5, and Triton Central punted the ball to Cardinal Ritter, which bounced out of bounds at the Raiders 27 yard line. 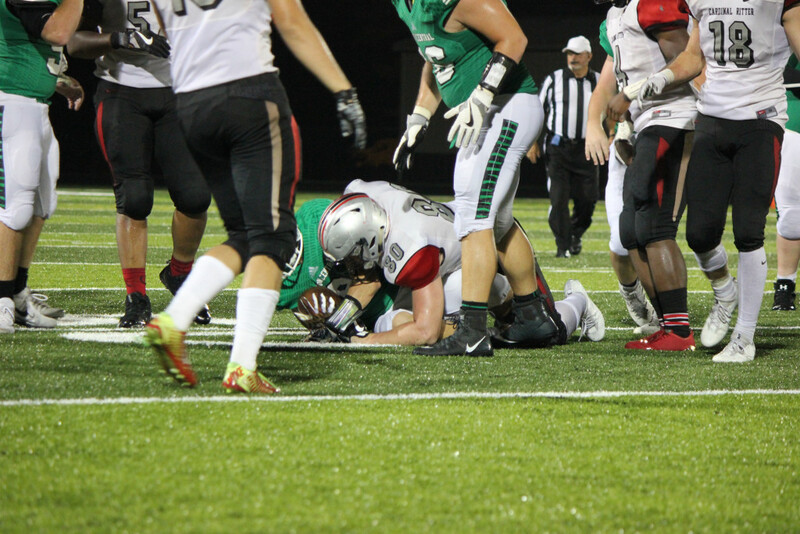 There was no gain on first down and the Raiders were charged with holding on second, pushing them back 8 yards from the line of scrimmage. 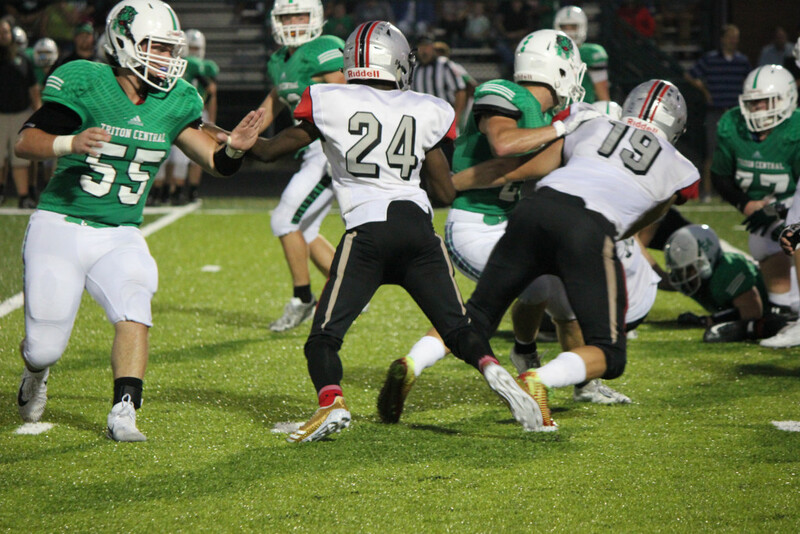 However, between the next two plays, Small ran for 34 yards collectively. 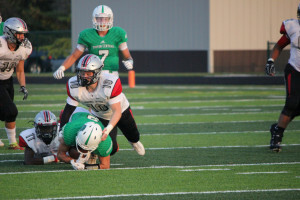 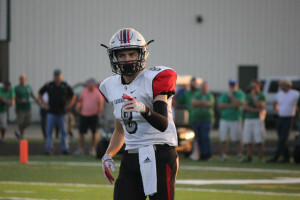 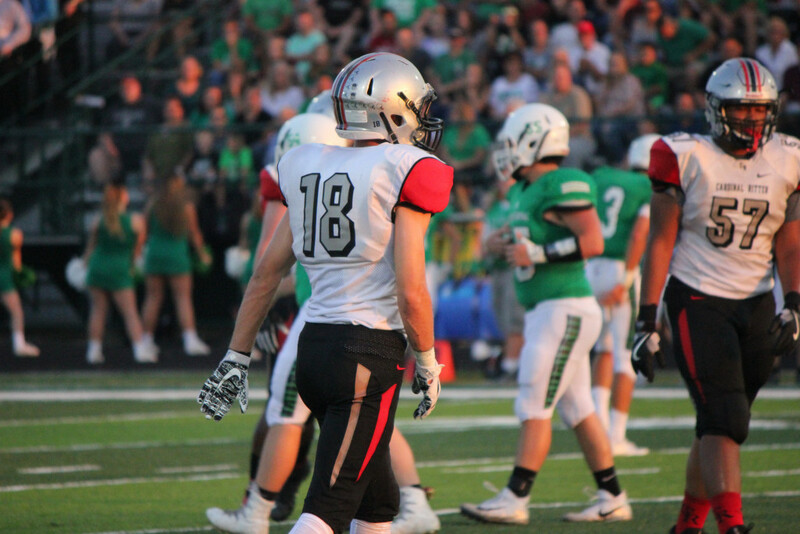 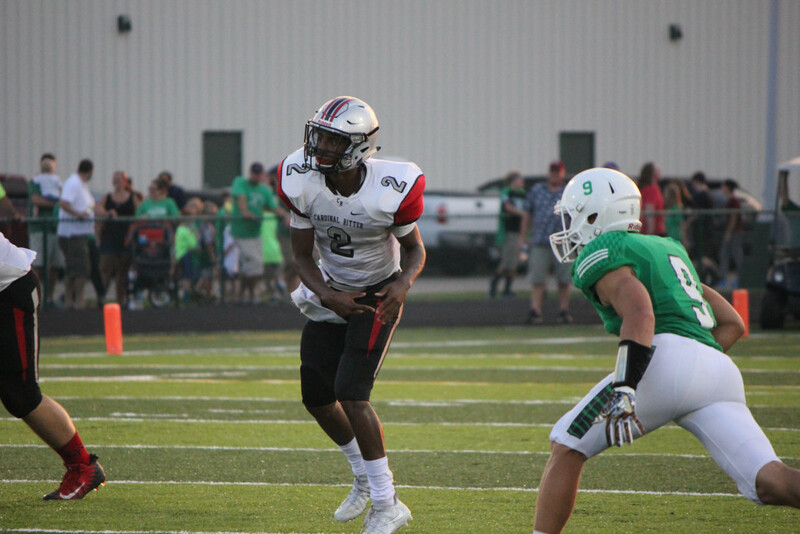 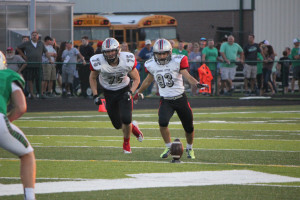 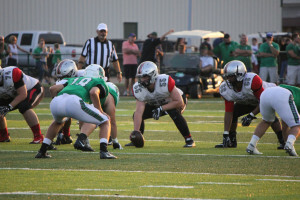 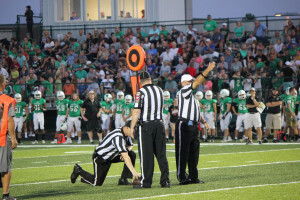 After suffering another 5-yard penalty, the Raiders turned the ball over again to Triton Central, who began their next possession from their own 35 yard line. 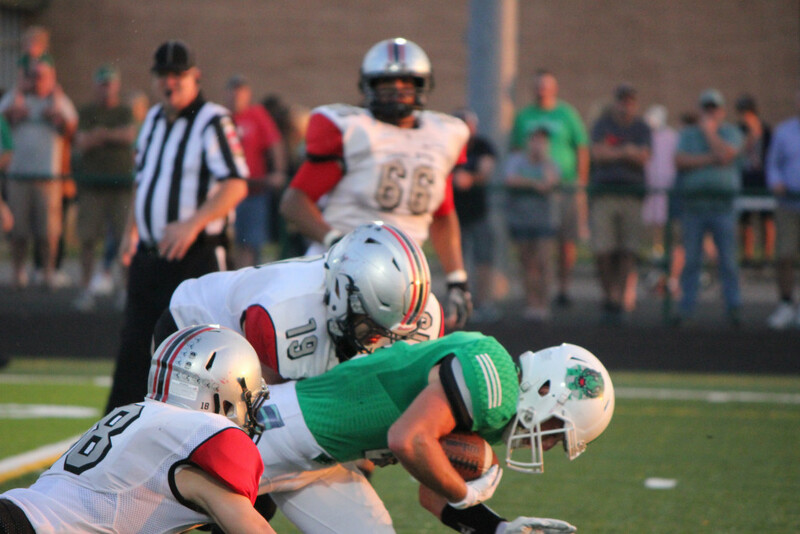 The Tigers ran the ball on first down and Morris was there on the tackle. 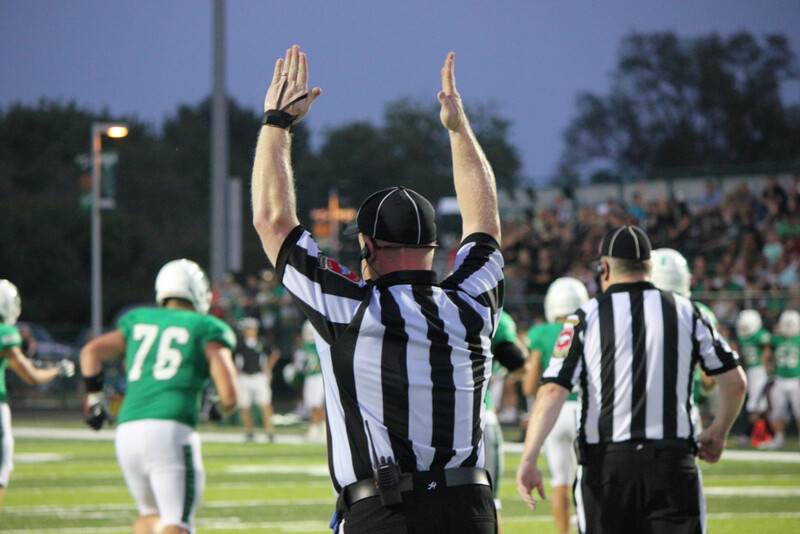 Triton Central was penalized with a personal foul, costing them 15 yards. 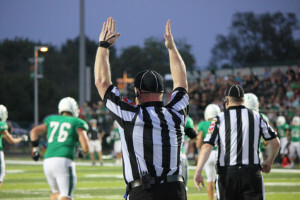 The Tigers could not convert over the next three plays and again punted the ball out of bounds, this time at the Tiger 46. 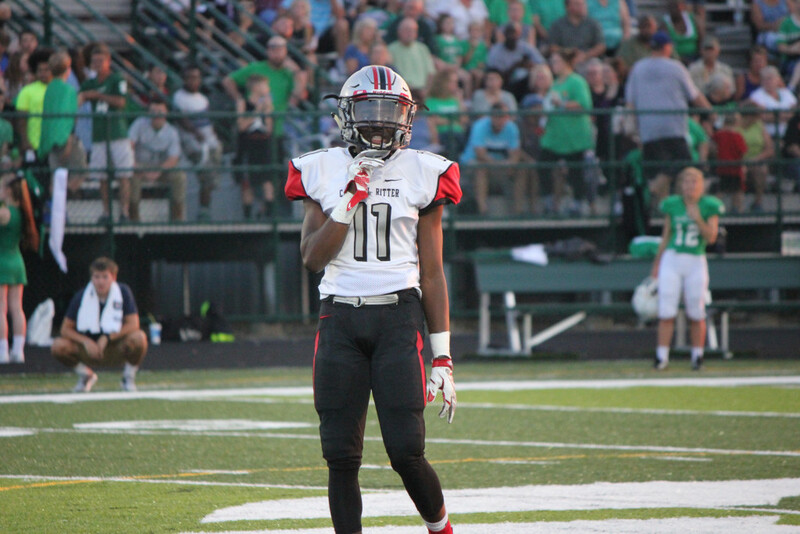 Bacon caught a ball on first down for 13 yards, but there was no gain on the next play. 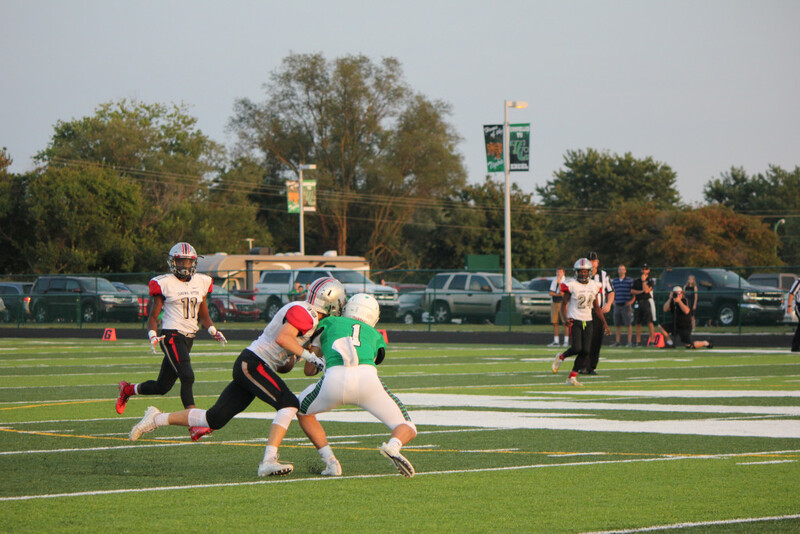 Small ran the ball on 2nd down for 7, but the Raiders lost five yards on the ensuing play. 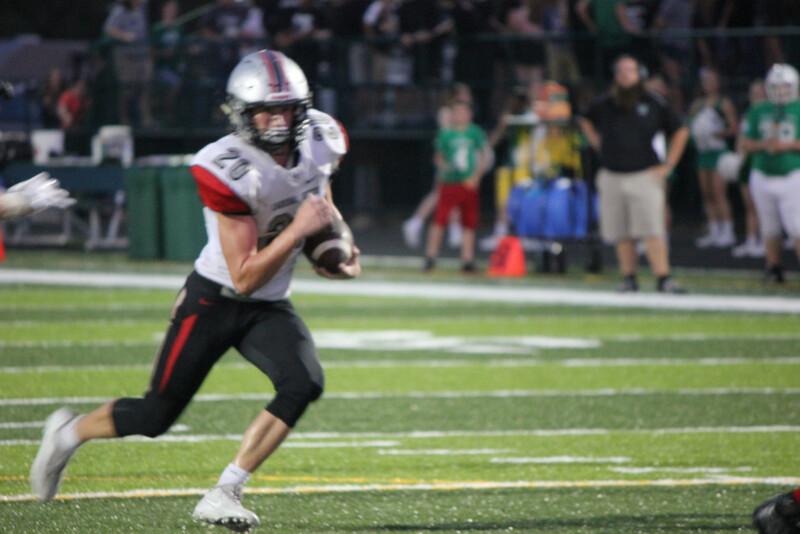 With 16 seconds left and the clock still ticking, Kluemper caught a 15-yard pass from Small, followed by a gain of 9 by Knutson before the time ran out. 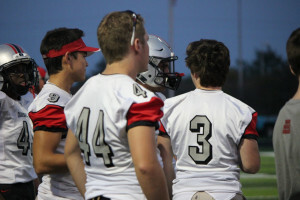 The score at the end of the third quarter remained 14-14. 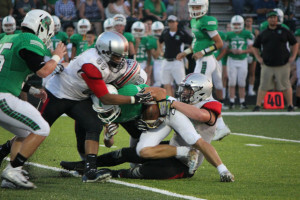 As the last 12 minutes of the game began, Triton Central mustered all of its homecoming momentum and powered forward. 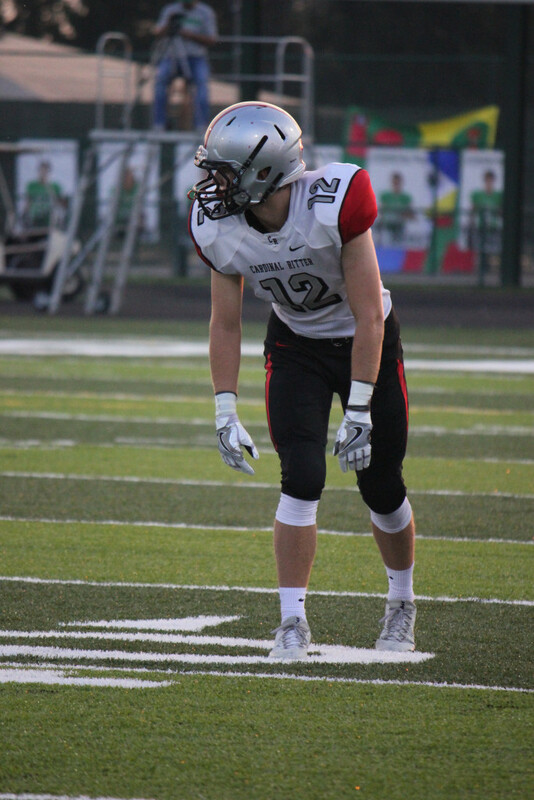 However, before they could pull ahead, Knutson picked up 3 yards on the next play. 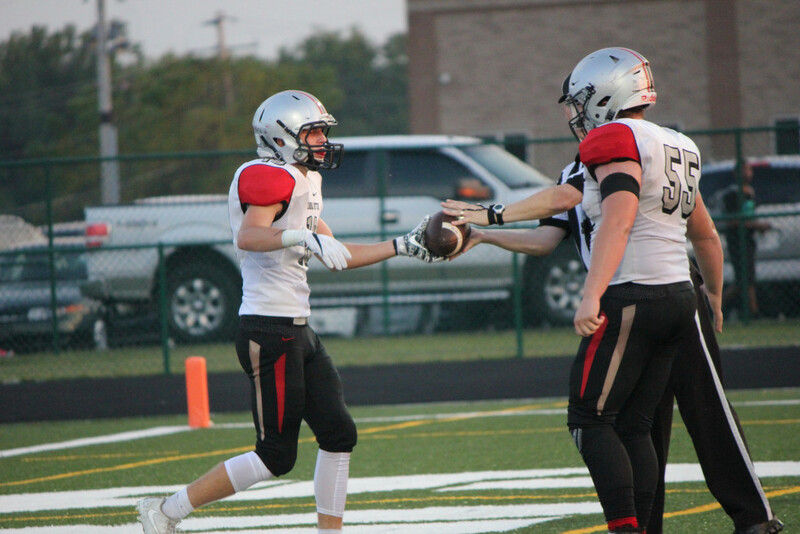 After a brief timeout, Kluemper scored another touchdown off of a pass from Small. 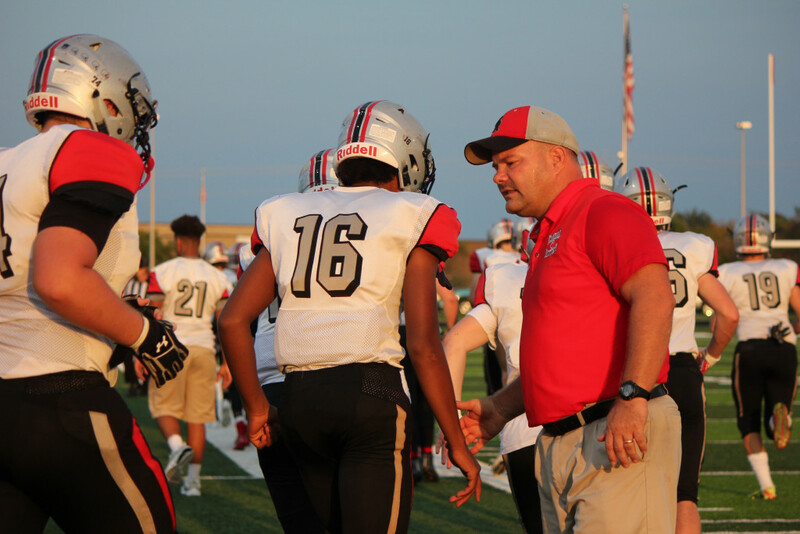 Boberg kicked the point after, which was good, giving the Raiders their first lead on the Tigers of the game. 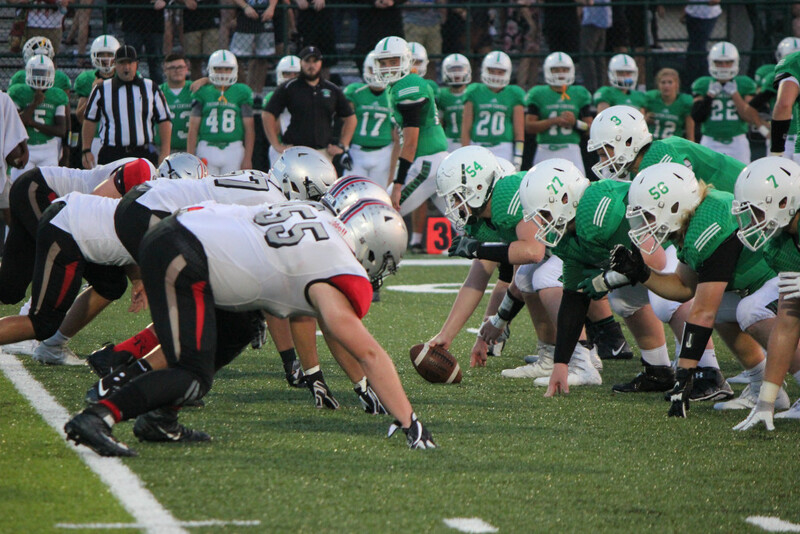 Boberg kicked a squib and Triton Central began from their own 37 yard line. 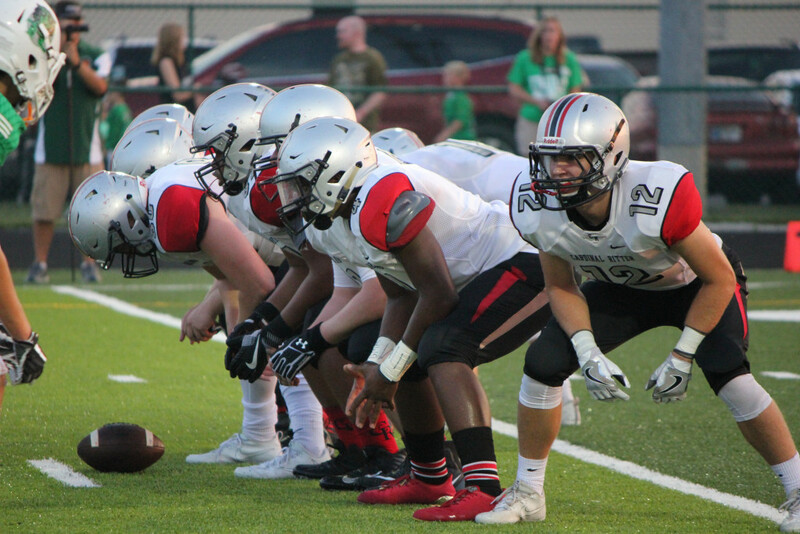 For the next 5 minutes, the Tigers ran the ball again and again, making small gains and taking them further and further down the field. After completing a huge pass deep into Raider territory, Triton ran the ball into the endzone and completed the point after, tying up the game once again. 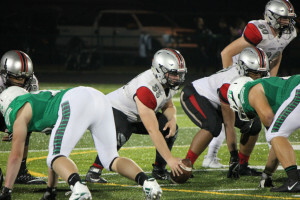 The Tigers kicked back to Bacon, who returned the ball to the Raider 33 yard line. 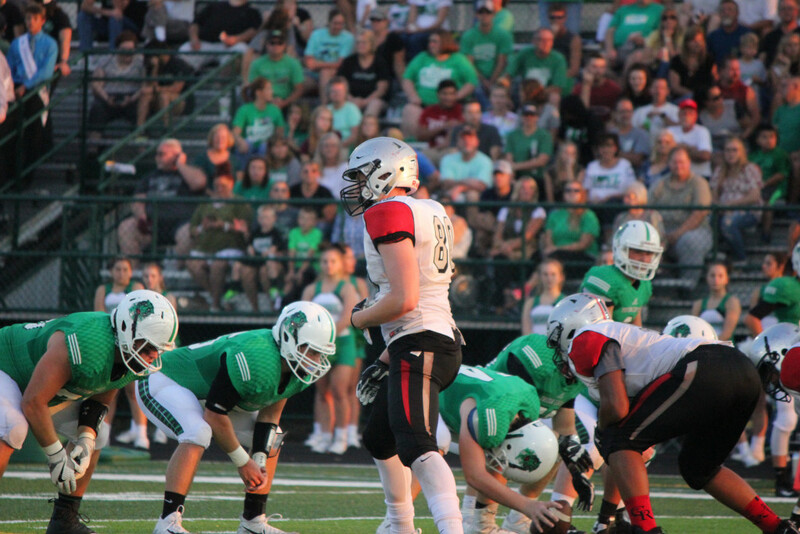 After a timeout, Cardinal Ritter threw an interception on the first play of their drive, turning the ball over to Triton Central at the 50 yard line. 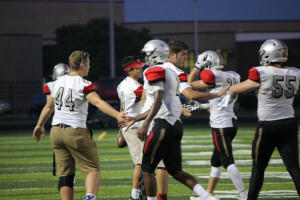 Again, the Tigers began eating away at the clock, moving down the field until they scored a touchdown and pulled ahead with 2:24 left in the game. 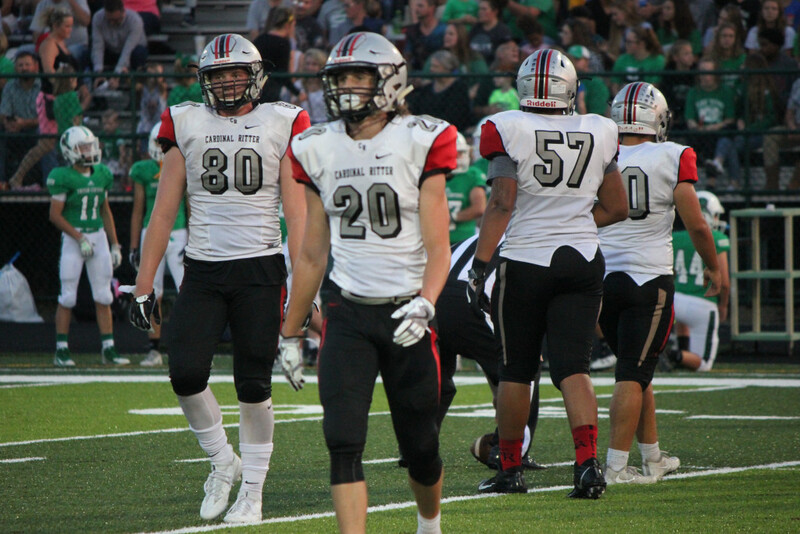 Kluemper, Ayala, and Olejnik fought hard on defense, but it is no easy feat when it comes to defeating a team fueled with the energy of their student section and fans on their new home turf during their homecoming. The PAT was good and the Tigers kicked back to Cardinal Ritter. 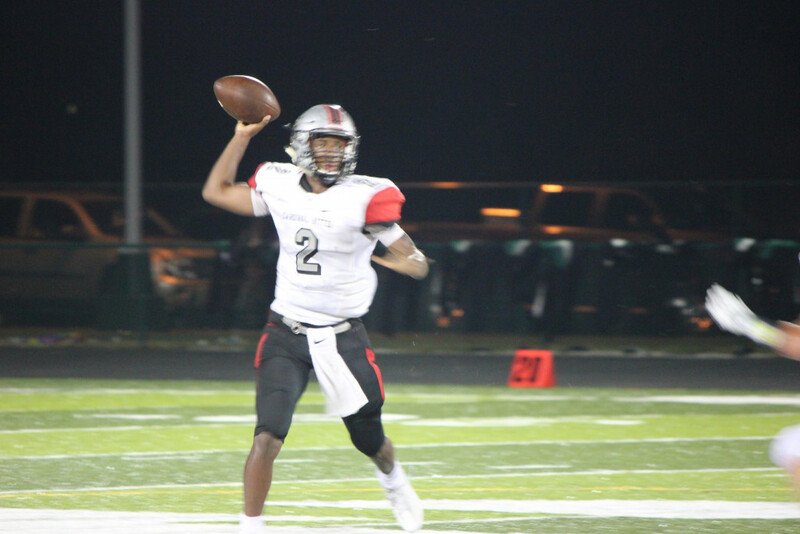 Bacon returned the ball to the Raider 27. 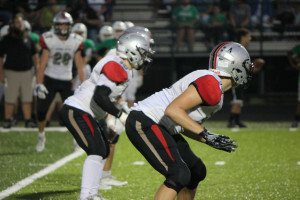 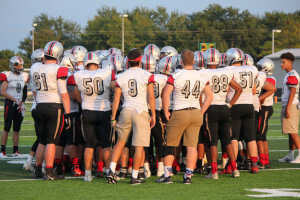 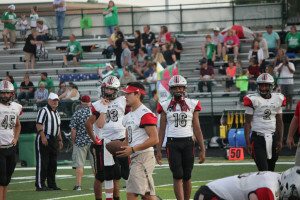 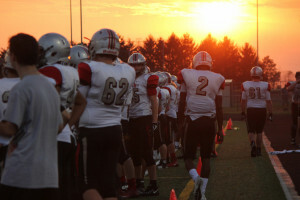 The Raiders may have stood a chance at possibly scoring a touchdown that would lead into the murky, gray-area state of existence that is overtime, but that chance was whisked away as the Raiders fumbled the ball on first down, which was promptly recovered by Triton Central at the Raider 49 yard line. 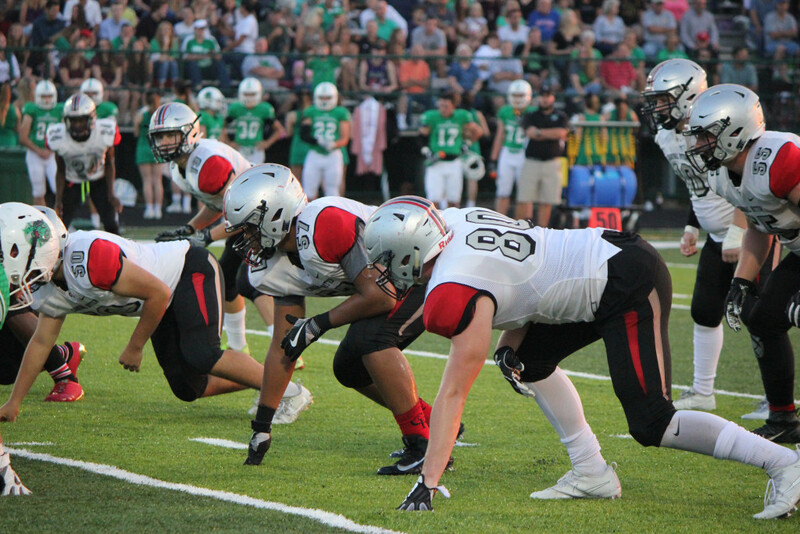 During the last three plays of the game, Roberson, Knutson, and Manolo “Man-O-War” Suazo all made tackles alongside the Cardinal Ritter D-line. 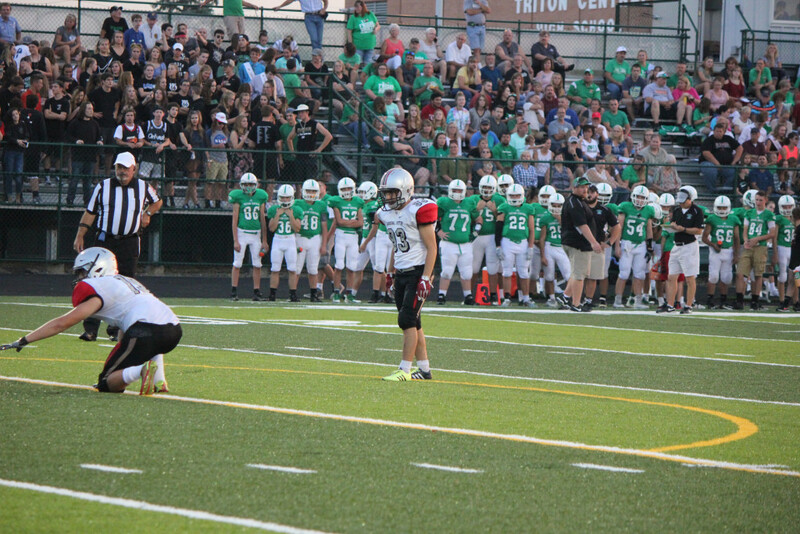 The Tigers knelt the ball on the last play of the game at the Raider 23. 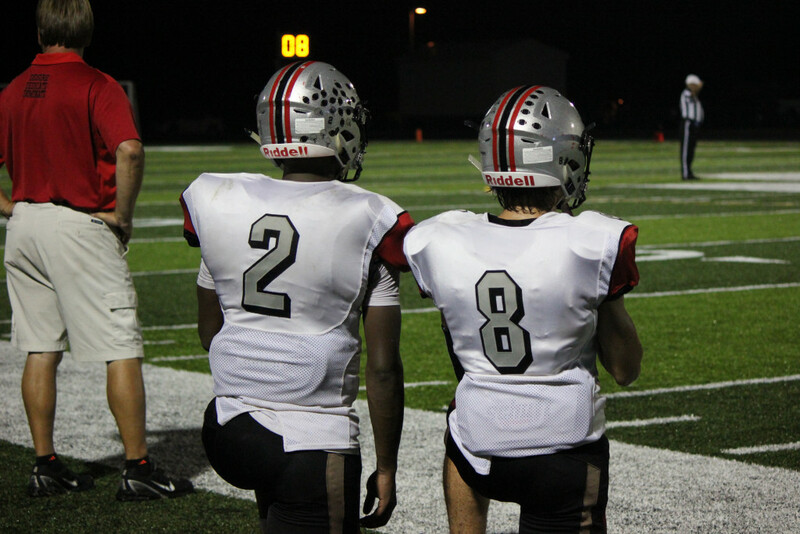 The last seconds of the game ticked away and the scoreboard read 28-21, Tigers. 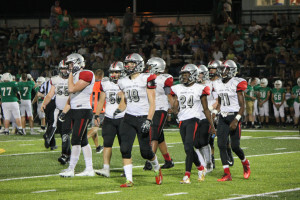 The Raiders offense was led by Small who was 11-17 for 141 yards and 2 Touchdowns in the air while gaining 59 yards on 8 carries on the ground. 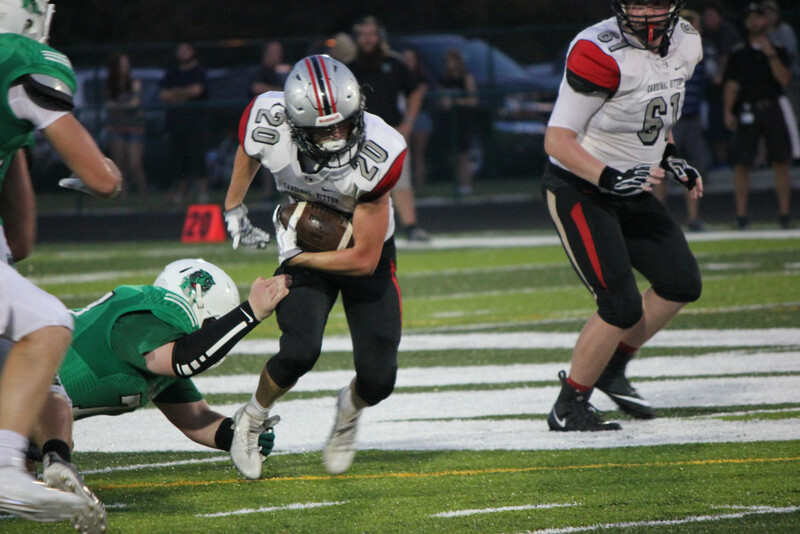 Knutson also ran the ball 9 times for 39 yards and a score. Kluemper had arguably his best offensive game as a Raider, catching 6 balls for 73 yards and 2 touchdowns. Woodcock was a force on the receiving end as well pulling in 2 balls for 55 yards. 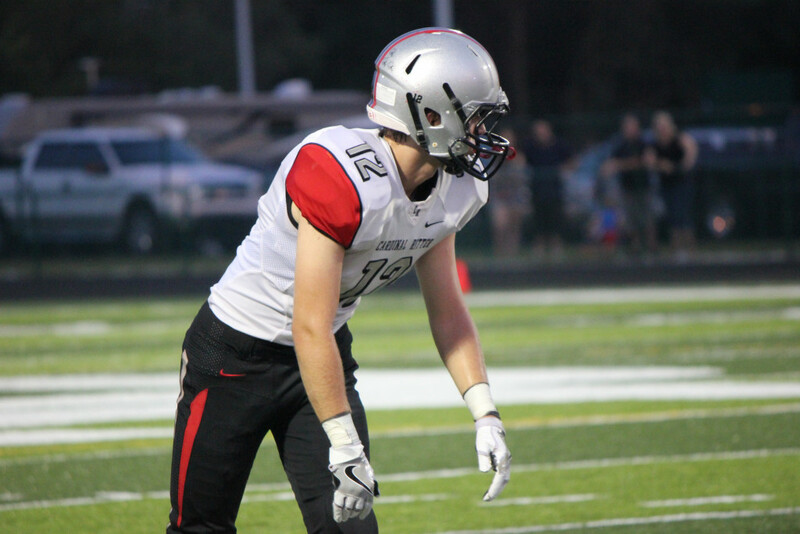 The defense was led by Olejnik at middle linebacker who had 14 tackles, 11 which were solo. Aiding in the defense was Morris with 9 tackles, Giebel with 8, Kluemper with 7, Rodgers with 6 and Knutson, Anderson, and Ayala with 5. 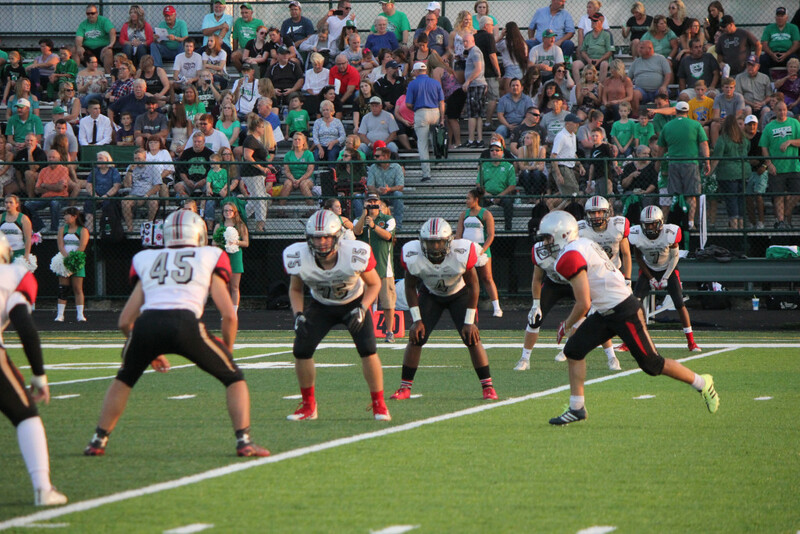 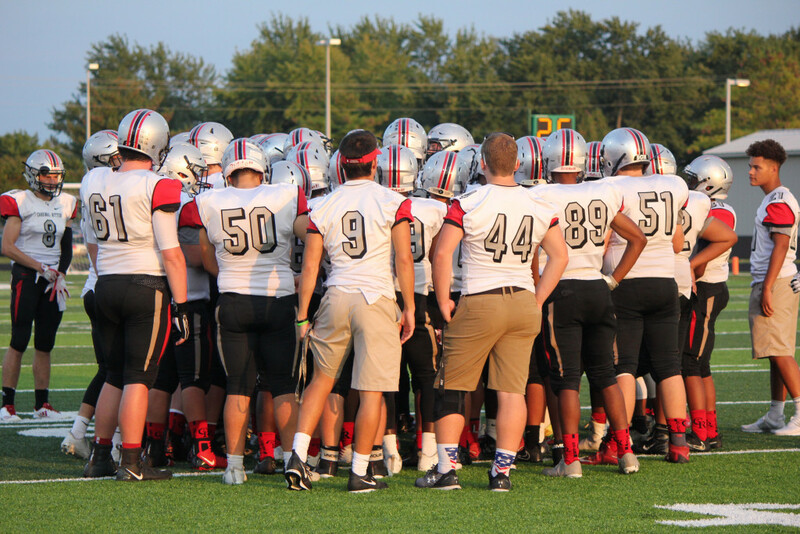 The Cardinal Ritter Raiders will be playing a home game next Friday, September 29, against the Beech Grove Hornets. 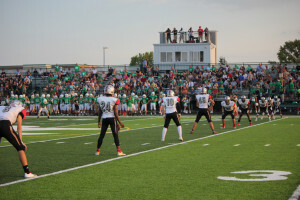 Head out and cheer on your players!